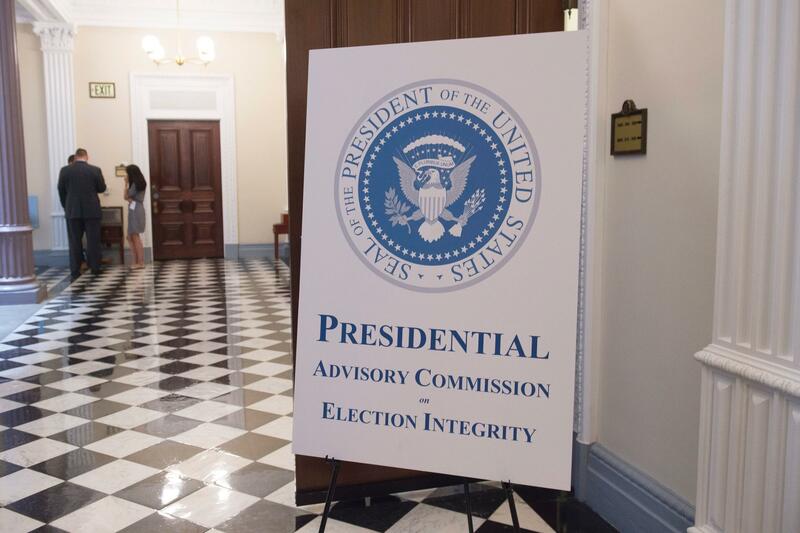 A sign appears outside the room where the first meeting of the Presidential Advisory Commission on Election Integrity in the Eisenhower Executive Office Building in Washington, DC, July 19, 2017. But Lawson says she doesn't think anybody's being shut out because "right now, there's nothing going on." Speaking to reporters after testifying about voting matters on Capitol Hill, Lawson says her understanding is "that they wanted to get some of these lawsuits settled and then move forward." "It's very chilling to know that you can't really work without somebody suing over something that you've done," she adds. "We're not emailing each other. We're not conversing with each other." Liberal advocacy groups have sued the commission, arguing that it is not complying with federal open records laws. The groups believe that the panel, which was formed after Trump alleged without evidence that up to five million people voted illegally last year, has been set up to justify policies such as requiring voters to show documents proving that they're U.S. citizens. The commission's chair and vice chair, Vice President Mike Pence and Kansas Secretary of State Kris Kobach, both Republicans, have denied they have preconceived ideas about what the commission will recommend. But actions by Kobach and others on the panel have fueled the suspicions. One lawsuit revealed that Kobach had proposed tightening proof-of-citizenship laws to the Trump presidential transition team. Kobach's first act as vice chair was to send letters to all 50 states requesting detailed voter records, which Kobach says can be used to help identify illegal voting. This week, one of the groups suing the panel, the Lawyers' Committee for Civil Rights Under Law, filed Freedom of Information Act requests with three agencies, seeking all communications with the presidential commission. Documents released earlier in court indicate that the panel has communicated with the Social Security Administration and the Department of Homeland Security, both of which have databases that could be used to help identify illegal or outdated registrations. "The lack of transparency of this commission is ominous," Lawyers' Committee president Kristen Clarke said in a statement. She noted that two Democratic members have sent letters to the panel's staff complaining that they don't know what's going on and asking that they be sent copies of all communications. One of those members, Maine Secretary of State Matthew Dunlap, says he received an email Wednesday from the commission's executive director, Andrew Kossack, acknowledging receipt of his letter. But Kossack added that due to pending lawsuits, he was "consulting with counsel regarding a response to your request to ensure any response accords with all applicable law." "I don't think I'm asking for something unreasonable," says Dunlap, adding that the fact that the commission staff has to consult with lawyers before sharing information about the commission with one of the commissioners is a sign the panel is "in more trouble than we thought." The commission has held two public meetings so far, the last on September 12th. The tentative plan had been to meet again in November, but nothing has been scheduled. Kobach told the PBS NewsHour Monday that there will be another meeting "in the next few months." Kossack said in a statement to the NewsHour that "members of the commission have been consistently kept abreast of its work." The panel had planned to issue a report early next year, but Lawson think that's now unlikely and it will complete its work later next year. The commission's stated purpose is to recommend ways to boost confidence in the integrity of U.S. elections.